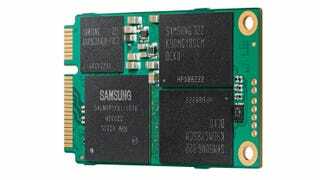 If you feel like your ultrabook is limited in capacity, that won't be the case much longer: Samsung has just announced the industry's first 1TB mSATA SSD, which'll give any ultra-thin laptop a shot in the storage arm. Slim devices—not just ultrabooks—make use of mini-Serial ATA drives to squeeze storage into their delicate frames, as opposed to the 2.5-inch drives found on most laptops. But the problem with the smaller 1.8-inch mSATA drives is they don't have quite the same capacity.